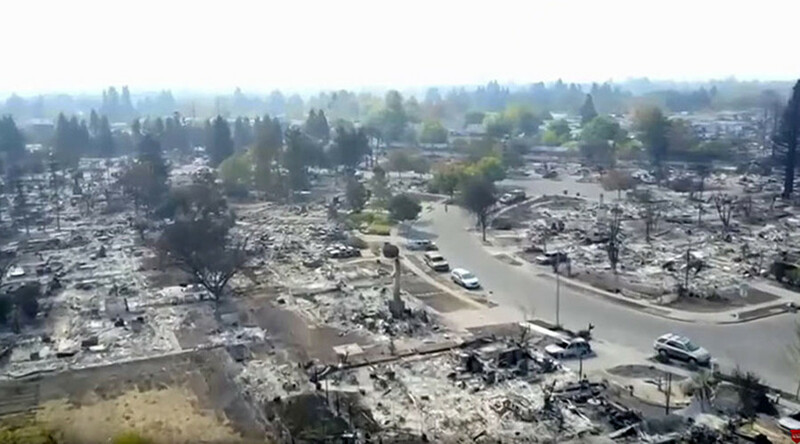 The urge to get drone footage of the devastation caused by wine-country wildfires has landed one man in jail, as California officials warn that flying drones can interfere with firefighting efforts. CHP said the state’s forestry and fire protection service reported multiple drones in Napa and Sonoma counties, which were hindering the firefighting efforts. Nestor Rodriguez, 24, was arrested on Sunday after flying his drone over Petaluma Airport in Sonoma Valley. This forced firefighting helicopters to remained grounded for at least 10 minutes. Rodriguez was cited for impeding emergency personnel. He told police he did not know that flying a drone in that area was illegal. “The drone was not only potentially perilous for the helicopters landing at and leaving the airport, it also held up the operation endangering lives and further fire damage to an already fire ravaged area,” the Petaluma Police Department said. This is not the first time California firefighters have had trouble with drones. During the wildfires in 2015, a four-foot drone caused operations to shut down for one evening, which resulted in an additional 3.5 acres getting burned, KTLA-TV reported at the time. Firefighters are battling a new fire that sprang up overnight on Monday in the Santa Cruz mountains south of the San Francisco Bay, prompting evacuation orders. A house fire is believed to have sparked the quick-spreading blaze. At least one structure is destroyed and around 100 homes threatened, KNTV news reported, citing the California Department of Forestry and Fire Protection. Firefighters plan to attack the fames from the air once the sun rises. A cluster of wildfires, the deadliest in Californian history, have been ravaging the wine country for more than a week, leaving at least 40 people dead and destroying nearly 6,000 homes and business. Most of the deaths were reported in Sonoma County.